Figure 1. Mounting of a memorial sundial in Trebinje, June 30, 2018. 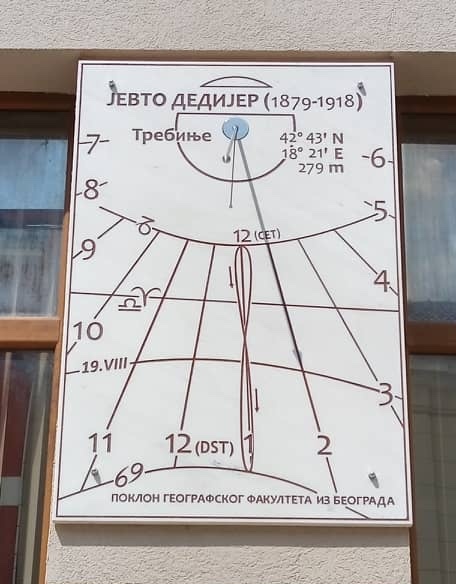 The sundial dedicated to the memory of a prominent Serbian geographer Jevto Dedijer (1879–1918). The design was made for a marble plate measuring 150 x 100 x 3 cm. The dial consists of the time lines for exact hours and the date lines for solstices and equinoxes. The hyperbola for August 19, the day of the Holy Transfiguration of Our Lord and the Patron Saint’s Day of the city of Trebinje was also added (Figure 2). The shadow will be thrown by an inox polos (40 cm) directed to the North celestial pole. The direction of the shadow of the polos will show daylight hours whereas the end of the shadow will show these dates.